I learned to knit as child sitting at my Grandma’s knees. We didn’t have yarn winders then, it was just a hank of yarn stretched over two little arms(mine). Those days still bring back wonderful memories. Years went by before I began knitting in earnest again. Marriage, kids, work, you name it, I never seem to have the time. Then came retirement and an old Vogue Knitting magazine. When I saw that lace top I was hooked. I knew how to do the basics, but that picture really peaked my creative juices. The next thing I knew I was knitting a Print O Wave by Yuni Jang. This was the result. Of course the picture is enhanced by the beautiful harp that my husband built for me a few years ago. 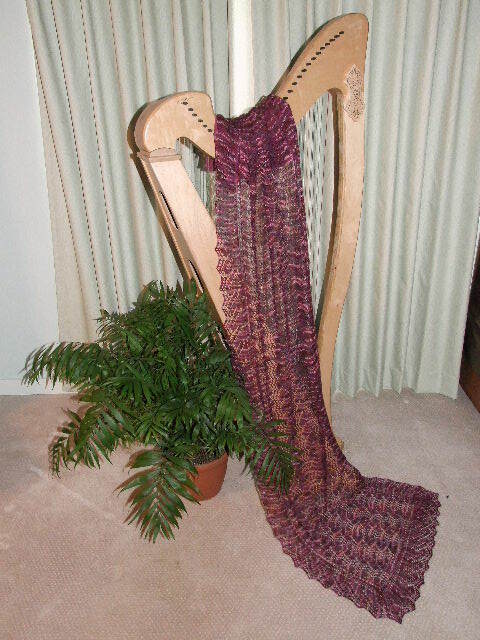 Lace and harp music, just seem to go together. From here I moved on the colorworks, then double-knitting, and writing tutorials from projects that just seemed to beggar the question-there’s got to be a better way to do this. That challenge is still going on today, and with me it probably will never end. It will definitely keep me out of trouble. Maybe! I just found your website today while searching for “toes up tabi socks.” It is just what I have been looking for!!! We are two peas in a pod! I prefer toe up, magic loop, my husband and I live in flip-flops, and I like preciseness, and for my toes to fit. Also, though I haven’t really learned to play it yet, my husband built me a celtic harp. Just waiting for retirement! Evangeline: Thank you for your kind remarks.